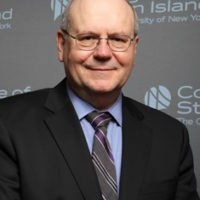 Dr. William J. Fritz was appointed by the Board of Trustees of The City University of New York to serve as Interim President of the College of Staten Island on August 15, 2012. He received his BS and MS in Biology from Walla Walla College and a PhD in Geology from the University of Montana. Dr. Fritz is an internationally known ﬁeld geologist and has published more than 50 articles and guidebooks on sedimentation around modern and ancient explosive volcanoes, as well as on sedimentology, stratigraphy, and paleobotany. His research interests are on the volcaniclastic sedimentation and tectonics of southwestern Montana in response to the Yellowstone hotspot, and volcanic controls on sedimentation in Ordovician rock in Wales and Ireland. He has authored two textbooks and a popular book on the Roadside Geology of the Yellowstone Country, convened a prestigious Penrose Conference, published in Nature and Science, and participated in international initiatives. His research has been funded by the National Science Foundation and the Department of Energy. After graduate school, Dr. Fritz worked for two years as an exploration geologist for Amoco Production Company and then joined the faculty at Georgia State University, an urban doctoral/research-extensive university of 28,000 students. At Georgia State, he enjoyed two careers over 27 years – one as a faculty member and the other as an administrator. As a faculty member, he was promoted from Assistant to Associate to Full Professor. As an administrator, starting in 1998, Dr. Fritz rose through the ranks from Director of Freshmen Studies at the College of Liberal Arts and Sciences to Senior Associate Provost for Academic Programs and Enrollment Services.